On Monday, video surfaced on Reddit showing a SkyRunner “flying car” crashing into a building. And while the video is certainly horrifying, there wasn’t any context for the accident—just the typical Reddit jokes. But we just learned more from SkyRunner. Thankfully, both the pilot and the passenger survived. According to SkyRunner, which has FAA certification for the vehicles, the incident happened in the United Arab Emirates on February 9th at 10:15am GST. SkyRunner sometimes operates these vehicles themselves for various promotions but it also sells the vehicles to third parties. This was a case of the latter, according to the company. “A company which owns a SkyRunner was performing a routine flight on Friday when it came in contact with a building,” SkyRunner CEO Stewart Hamel told Gizmodo today by email. “Both Pilot and passenger are stable, neither sustained life-threatening-injuries. We understand the incident is currently under investigation in the UAE and we will report further when we know more,” said Hamel. So there you have it. The pilot and passenger, still unidentified, were injured but they’re going to be okay. At least according to SkyRunner. Gizmodo has been so far unable to identify the pilot and passenger for confirmation. 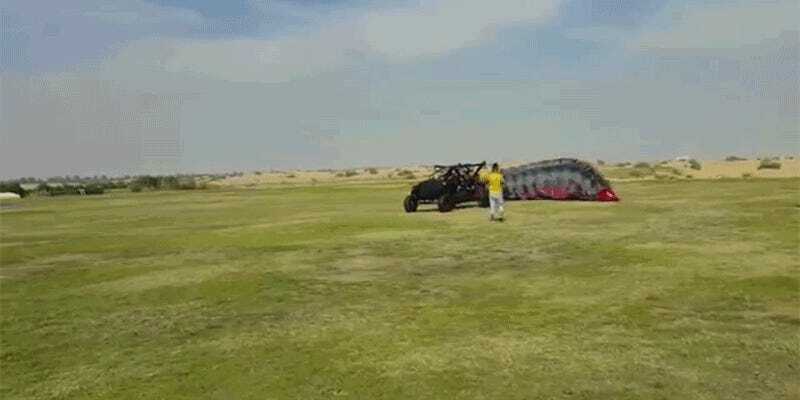 Sadly, this wasn’t the first time that a flying car has crashed. Aeromobil had a bad accident during a test flight in 2015, but the pilot survived thanks to an emergency parachute that deployed from the aircraft. And in 2014, a Maverick flying car crash in Florida left two people injured. A crash is never great, but it’s especially bad timing for the flying car community, as people here in 2018 are still incredibly excited about the prospect of living like George Jetson for their commute to work. And the promises keep on coming that flying cars will be mainstream in just two years. Is The Flying Car Finally Here?